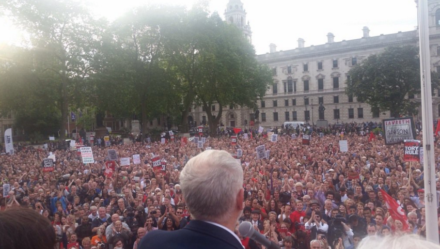 Jeremy Corbyn will tonight rally Labour activists for the campaign finale when he addresses six towns and cities simultaneously alongside a series of celebrity supporters. Corbyn, who is appearing in Birmingham, will be beamed across locations in England, Wales and Scotland as Labour attempts to capitalise in a remarkable tightening of the polls before Thursday’s vote. The Labour leader, who aims to enter Downing Street after one survey put him just a point behind the Tories, will be broadcast to Glasgow, Brighton, London, Warrington and Barry in Wales. In contrast with the Tories – who have frequently struggled for high-profile supporters from the arts – he will speak with backing from comedians Steve Coogan and Ben Elton, actress Maxine Peak and musicians Wolf Alice and Reverend and the Makers. Corbyn has been buoyed by a confident campaign, but aims to avoid the fate of Ed Miliband, who frequently polled ahead of David Cameron in the polls and won a string of celebrity endorsements but ended up losing seats. Tonight Corbyn will hail the “message of hope” which Labour has taken across the country since Theresa May called a snap poll. “While the Conservatives promise five more years of a country run for the super-rich and cuts for everyone else, Labour will transform Britain by investing in infrastructure and new industries and rebuilding the NHS and our public services,” he is expected to say. “Labour will abolish tuition fees to give everyone a chance to fulfil their potential and create a fairer Britain by introducing a £10 an hour minimum wage, banning zero hours contracts, protecting winter fuel payments and safeguarding state pensions through the triple lock. While Corbyn is in the West Midlands, a series of key frontbenchers will appear at the other locations. John McDonnell, actress Tanya Franks; Sarah Jones, the Croydon Central candidate, and Elton will attend the London event.